I love a good bowl of chili and my Dad made a pretty good chili that was a popular lunch item on the menu at Lista’s. In those days we called it “Chili con Carne” (chili with meat) — I guess to differentiate it from the chili made without meat, which I never heard of until the vegetarians came to power. And our chili had beans, mostly dark red kidney beans, because that’s how every self respecting chili was made in the Northeast, after all we were in Brockport, not San Antonio! Chili con carne was also a staple in our house growing up, but it was the standard stuff made with ground beef, onions, beans, and an envelope of French’s Chili-O seasoning mix. Still it was pretty tasty and about the only time we ate Fritos corn chips for dinner. When I had my own family, I made chili con carne every week because my kids just loved it (as long as I didn’t put any diced tomatoes in it… chunks were very taboo with my kids). And I definitely served my chili with corn chips — and cheddar cheese on top. Now getting back to my Dad; after the restaurant closed in 1980, Dad started his second career at SUNY College at Brockport. And when Dad retired from the college, he started hosting a weekly poker night with some of his former co-workers and old friends. Now my Dad was a darn good poker player and I’m sure he enjoyed the game — but the truth is his main deal (pun intended) was to whip up a regular buffet of eats for these guys. Dad made sandwiches, and dips, and cheese trays, and brownies… and he always made a batch of his chili con carne. And I think the guys liked the chili most of all. I’m not much of a card player myself, so I never sat in on Dad’s poker games (although my brothers did from time to time) but I had occasionally been at the house when the guys were coming in and hear them rave about the food Dad provided. Dad was always happiest when he was cooking and serving food to people who truly appreciated it. I guess that’s one thing he passed down to me. As I was making the chili for this post, it occurred to me that the recipe has a lot of 3’s in it. 3 pounds of ground beef, 3 vegetables, 3 types of tomatoes, 3 primary seasonings, and for this version 3 kinds of beans. I think this recipe is a good basic chili and would appeal to most palates (not too spicy, no exotic ingredients, no odd flavors). Of course like any recipe on this site, I’m working from my memories of how we did things at Lista’s or how my Dad taught me to make things, so always feel free to tweak the recipe to your own taste and preferences. 1. In a large soup pot or dutch oven over medium-high heat, cook uncovered, stirring the ground beef until completely crumbled and no longer pink – about 15 minutes. Drain grease and return meat to pot. Reduce heat to medium. 2. Clean and dice the onion, green pepper and celery and add to the cooked meat and continue to cook and stir until vegetables are tender – about another 15 minutes. 3. Stir in the tomato paste and cook for another 5 minutes. Add the diced tomatoes, crushed tomatoes, chili powder, cumin, oregano, garlic (if desired), and cayenne pepper (if desired) – stir to incorporate and continue to cook over medium heat, stirring occasionally, for another 15 minutes. Note: to amp up the heat increase the chili powder and cayenne pepper to your liking. 4. Add drained and rinsed beans, stir gently to combine, reduce heat to low and cook until heated through – about 15 more minutes. Taste and adjust seasonings to taste. 5. Serve as is or with your favorite toppings (such as corn chips, shredded cheese, sour cream, chopped onions, sliced jalapenos, sriracha, etc.). There you have it, Poker Night Chili con Carne. Whether you make it for the Big Game or family game night this chili will be a winner. I find it easy to prepare on top of the stove, but if you prefer to use your slow cooker just cook the ground beef as in step #1 – add the meat and rest of the ingredients to your crock pot and cook on low for 8 hours or high for 4 hours. My Dad often made the chili a day ahead and reheated it in the crock pot for poker night. And if you have leftovers they will keep in the refrigerator for up to 5 days or in the freezer for up to 3 months. This weekend I joined my wife, her sister, dad and stepmom for a Fish Fry at a local restaurant. As many of you know, Friday Night Fish Fry is a dining trademark in the Rochester NY area. As long as I can remember it was a regular Friday tradition for people all around our community to go to any number of restaurants for this iconic fish dinner. Traditionally served during the Lenten season (the six week period leading up to Easter Sunday) a typical Rochester area Fish Fry consists of a battered or breaded haddock fillet (the bigger the better) served with french fries, coleslaw and tartar sauce. Over the years this classic Friday night menu item has become available any day of the week; and it has made it’s way onto menus of most restaurants, taverns, and grocery stores… even Chinese take out places feature Fish Frys. Today practically any place that has a deep fryer will feature a Fish Fry. During those few years that I worked for my Dad at Lista’s Italian Cuisine, the Friday Night Fish Fry was truly an anchor to our financial week. From age 16 to 18 I was given the task of fryer cook on Friday nights. It was my job to produce the hundreds of fish frys that left our kitchen. It was a fast paced, greasy, stinky job but I really loved it and I was darn good at it! I can still remember the feeling of looking out the pass-through into the dining room and seeing the throng of people lining up — every table full, people waiting to cash out, people waiting for a table, and a line outside the door and literally down the block just waiting to get in. It felt both thrilling and overwhelming to see all those people and knowing that the greatest number of them would be counting on me to cook their dinners. We had two large deep fryers at Lista’s — one fryer was used for french fries, veal cutlets and a variety of other non-fish items; while the other was exclusively dedicated to the battered haddock. We would remove the fryer baskets and cook the fish right in the heated vat of vegetable oil. Each portion of fish was hand dipped and laid in the hot oil, allowing it to cook until golden brown and piping hot. Then it was plated with the requisite french fries and coleslaw and passed through to the harried waitstaff. During the busiest hours it was almost impossible to keep up with the demand… and on one occasion I was so intent on keeping up I actually grabbed the fish from the fryer with my bare hand just to get it on the plate! At Lista’s we featured battered fish frys and used only the finest boneless, skinless, Icelandic haddock fillets. At first we didn’t use beer in our fish batter (since we didn’t serve alcohol) but in the latter years we began to serve beer and wine and so added beer to the batter recipe. We also served a special Grade A, extra long french fry with a cut that was somewhere between a standard 1/4″ x 1/4″ cut and a steak fry. The fries had to be as impressive as the fish itself. Plus our coleslaw and tartar sauce were house made using family recipes that were far superior to the commercially made products that many places used. Above is a picture of my Dad’s recipe box and his hand written recipe card for fish batter — can you tell how much it was used? This box is one of my most prized possessions and one of the few remnants of my days working with Dad at Lista’s. So, in tribute to the good old days of Lista’s I’m featuring two recipes today, the first is the original Lista’s Fish Batter and the second is the original Lista’s Coleslaw. Give them a try with some good quality haddock and french fries and create your own Friday Fish Fry at home. 1. In a suitable mixing bowl, whisk together the egg and milk until completely combined and frothy. 2. Add in the flour, baking powder, baking soda and salt and whisk until smooth. 3. Allow batter to rest at room temperature 5-10 minutes before using (this give the leavening time to activate and makes the batter crispier). To fry fish: Start by patting dry the fillet with paper towels, dip the fillet in the batter completely and remove from batter allowing excess batter to drip off into bowl. Gently place the battered fillet into a large pan with approximately 3″ of hot (350 degree F) vegetable oil – about 1 1/2 quarts. Fry fish until golden brown on bottom (about 2-3 minutes) and flip over using tongs — allow to fry on other side until golden brown (another 1-2 minutes). Remove from hot oil with tongs and drain on a plate covered with several layers of paper towel. Keep warm while frying other fish fillets. Serve with french fries and the coleslaw below. 1. With a very sharp knife, slice the cabbage as thinly as possible and set in a large mixing bowl (or you can use a slicing attachment on a food processor if desired). Sprinkle cabbage with 1/2 tsp salt and let rest. 3. Add the parsley flakes, mayo and sugar to the bowl and mix thoroughly until well combined and everything is coated with mayo. Cover and refrigerate at least 15 – 30 minutes until cabbage has released some moisture. Stir coleslaw and season to taste with salt and pepper just before serving. Great with a Fish Fry or other home style meal. There you have it, Lista’s Fish Batter and Lista’s Coleslaw — just right for your own fish fry. Although we only used haddock at Lista’s you can use any mild white fish for a fish fry. The batter works great for chicken nuggets, onions rings, or other similar foods too. 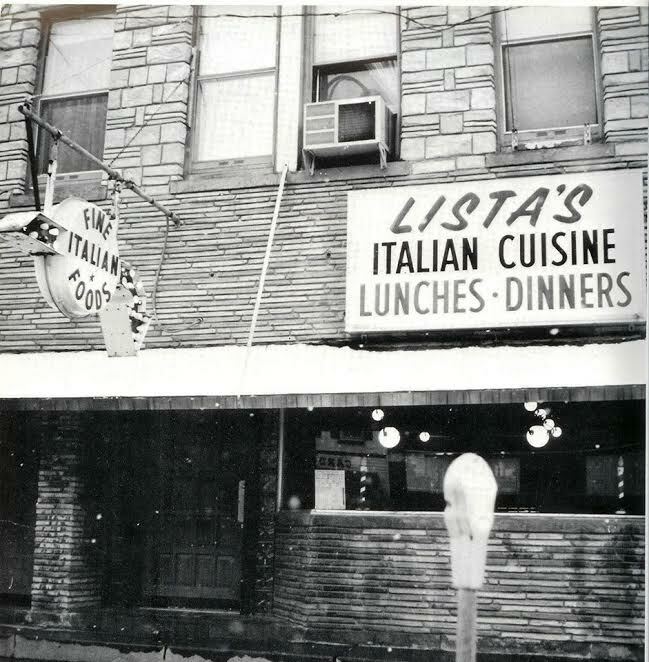 I hope this post brings back some memories for those of you that were fortunate enough to enjoy a fish fry at Lista’s Italian Cuisine. I would love if you shared your memories in a comment on this blog. Happy New Year 2018! The Lista family had a wonderful time celebrating the Holidays and now we are all hunkered down weathering the sub-zero temperatures and battling the ever present “white stuff.” Of course, while waiting for the inevitable break in this cold snap, I am looking for ways to warm us up with great winter recipes. One of my absolute favorite cold weather recipes is a soup that many people today would call “Italian Wedding Soup” but when I was growing up we simply referred to it as Escarole Soup… or more commonly just “scarola”. This soup is another familiar recipe from the Campania region of Italy, and was a Lista family favorite frequently made by my Grandma, my Aunts, and my Dad. I can remember watching my Dad make “scarola” and being fascinated by the way the greens would be so voluminous until they hit the simmering broth, and then they would wilt down to almost nothing… and I absolutely loved that this soup was made with those tiny hand-rolled meatballs! I also recall, occasionally, Grandma would beat an egg with a handful of grated cheese and drizzle it into the soup at the very end, stirring it gently to form thin shreds of egg throughout — just amazing! For me, Escarole Soup is one of those quirky dishes that doesn’t follow the culinary norm. But the combination of a light chicken broth with hearty meatballs really works — as does the use of the delicate pasta (acini de pepe) in contrast to the other sturdier ingredients — and the tender greens that counterbalance the firm bite of the meatballs. It’s actually this contrast and balance that gave the soup its misunderstood moniker of “wedding soup.” Contrary to popular belief this soup is not served at Italian weddings nor is its sole purpose to give the new couple stamina for their nuptial bliss. In truth, the name “wedding soup” is more of a mistranslation. In Italian, the soup was originally minestra maritata (married soup) which is a reference to the flavor produced when the broth and greens are combined or “married” together. I have heard that in some Italian-American families, this wonderful dish is also called “healing soup” because it is often made when someone is sick, knowing that the nutrient rich broth and veggies will provide comfort and nourishment to speed up recovery… one friend told me she always prays for the sick while rolling the meatballs as an added benefit. 1. Place all of the meatball ingredients in a large bowl and mix with your hands until thoroughly combined. Form the meat mixture into ½ inch meatballs, and place them on a platter or cookie sheet. Wrap them with plastic wrap and refrigerate them until ready to use. 2. In a 4 quart soup pot, heat the oil over med-high heat and cook the onions and celery until just tender about 5 minutes. Add the chicken stock, turn to high and bring it to a boil. Reduce heat to medium and keep soup simmering. 3. Gently drop the meatballs into the soup and let cook for 5 minutes. Add the pasta and carrots and let everything simmer for about 10 more minutes. 4. Add the escarole and simmer for another 5 minutes until wilted. Add salt and pepper to taste. 5. Ladle the soup into bowls and garnish with a generous sprinkle of grated Pecorino Romano cheese (and some crushed red pepper if desired). There you have it, Lista Family Escarole Soup. What a beautiful combination of flavors and ingredients to warm body and soul (and maybe to cure what ails you!) Serve the soup with some fresh Italian bread or even better toasted Garlic Bread. I hope you try this soup as a quick family meal or share it with friends at your next gathering.